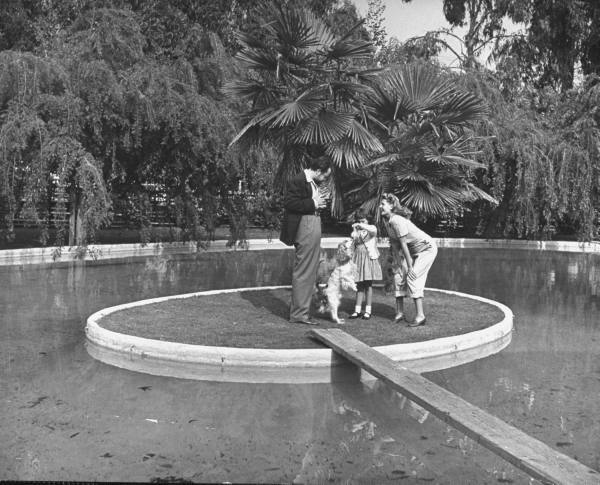 Crazy Shape Swimming Pools: Circle Island Swimming Pool in Los Angeles California. Actress Rita Hayworth, standing on the island inside the swimming pool with Orson Welles and his daughter from a previous marriage, 1945. 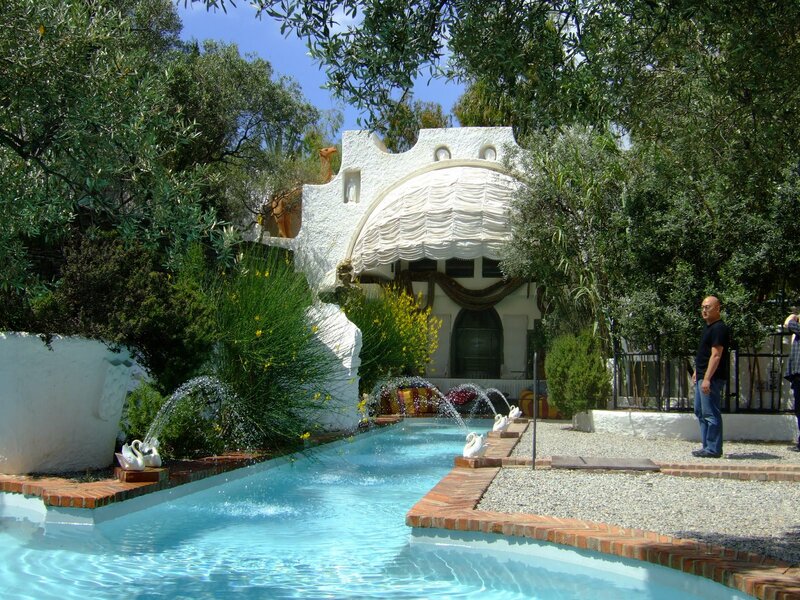 Crazy Shape Swimming Pools: Heart Shaped Swimming Pool in Bel Air California. Not only did she demand a "heart-shaped pool" but a "heart-shaped house" as well before she would agree to wed Mickey Hargitay. Perhaps a bit too kitchy but crazy never the less. Crazy Shape Swimming Pools: Piano Swimming Pool in USA. 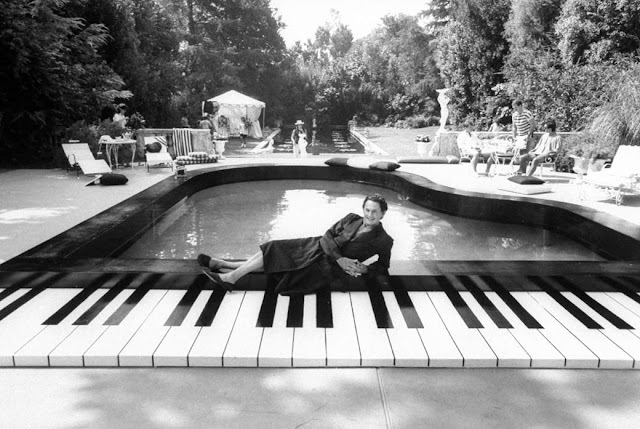 Actor Victor Garber, star of CBS TV movie, Liberace: Behind The Music, lounging in front of a piano shaped pool, wearing robe & slippers. Crazy Shape Swimming Pools: Free flowing outdoor/indoor Swimming Pool in Palm Springs California. 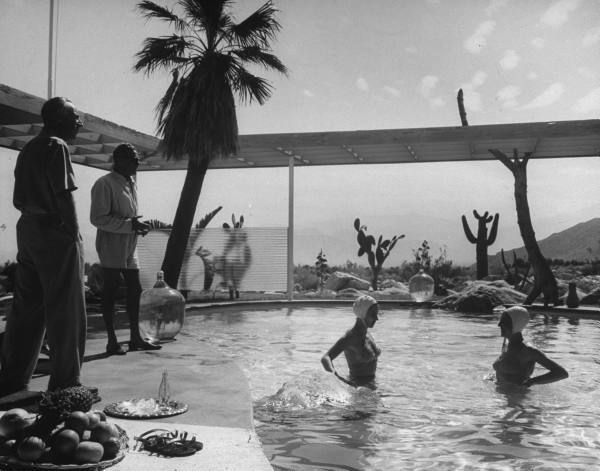 Industrial designer Raymond Loewy (second from left) standing by his swimming pool which runs from outdoors into part of living room, 1947. Crazy Shape Swimming Pools: Mirage Motel (aka Glass Pool Inn) in Las Vegas Nevada. The pool at the Mirage Motel featured seven oversized round glass windows. 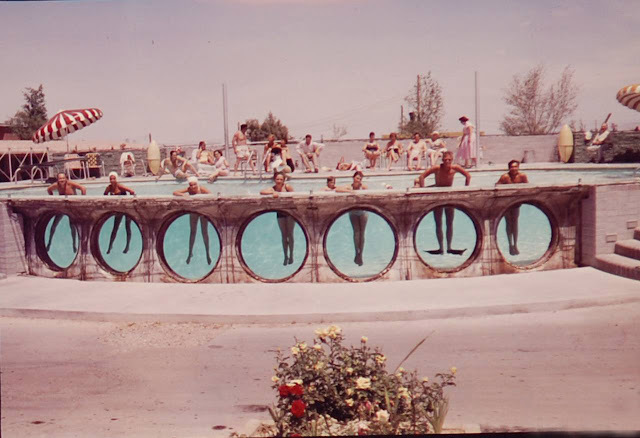 It was a beautiful mid century modern pool but the owners had to deal with constant leak repairs. In its heyday it was an amazing sight to behold when entering Las Vegas, early 1950s. The Mirage Motel was re-named "The Glass Pool Inn" after Steve Wynn purchased the rights to the name "Mirage" from the owners of the "Mirage Motel". The pool and motel were demolished in 2005. 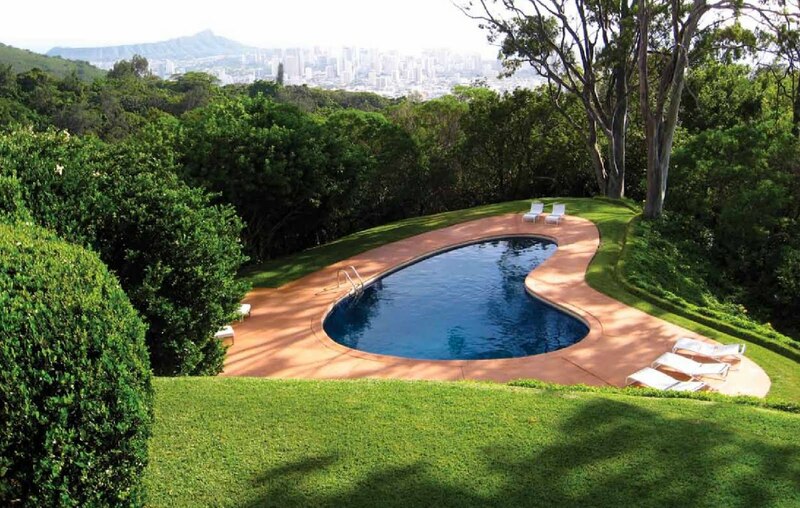 Crazy Shape Swimming Pools: Boomerang Shaped Swimming Pool at the Liljestrand House in Honolulu Hawaii. Designed by mid century modern architect Vladimir Ossipoff in 1952. Image Credit: Rizzoli. 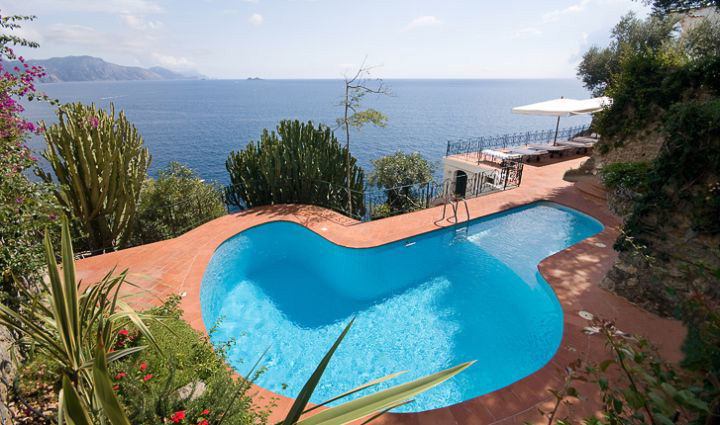 Crazy Shape Swimming Pools: Villa Gli Arieti Pool in Porto Ercole Italy. 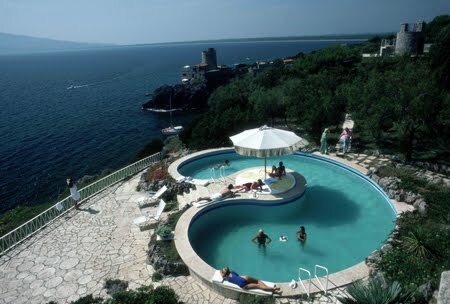 The pool at the Villa Gli Arieti, home of Lamberto Micangeli, Porto Ercole, Italy, September 1986. In the distance is his daughter Marina's 16th century castle, Torre Ansedonia..
Crazy Shape Swimming Pools: Clover Shaped Swimming Pool in Palm Springs. 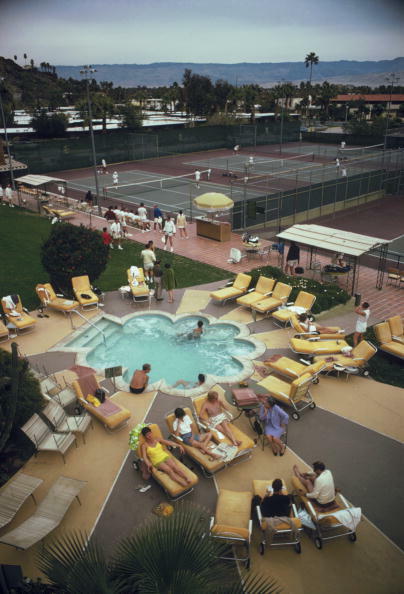 Members sunbathe around the pool at Palm Springs Tennis Club, California, circa 1970. 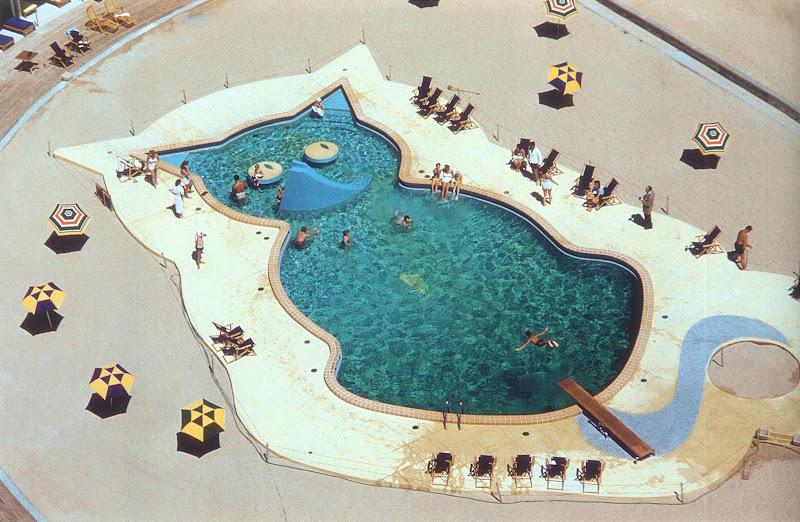 Crazy Shape Swimming Pools: Cat Shaped Swimming Pool in Miami Florida. The pool at the Fontainbleau Hotel, Miami, Florida, 1955. Crazy Shape Swimming Pools: Fluffy Little Cloud Swimming Pool in St. John Caribbean. 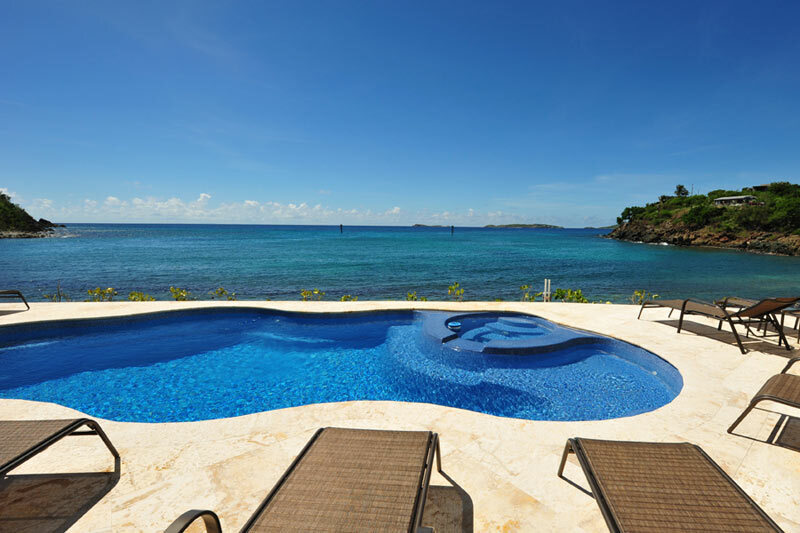 The wealthy owners wanted to re-create a pool that resembled a little fluffy cloud. 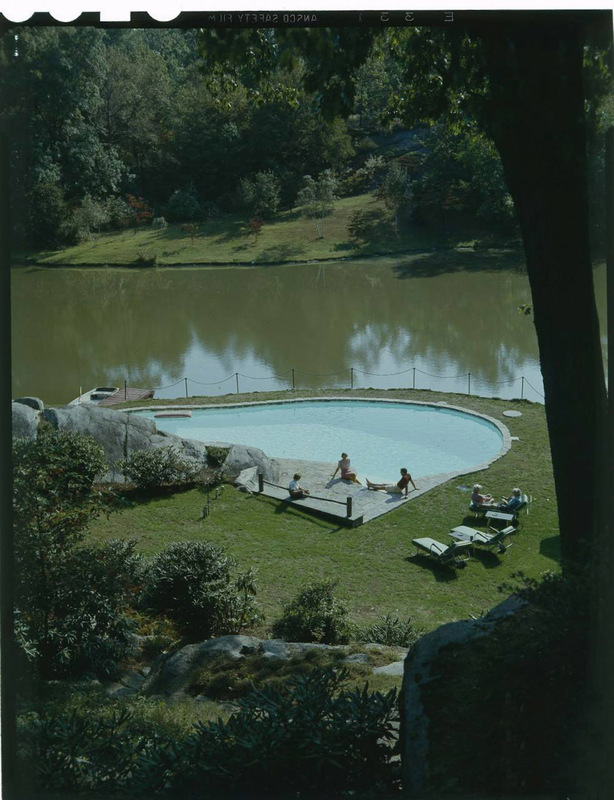 Crazy Shape Swimming Pools: Heart Shaped (perhaps not that obvious) Swimming Pool along lakeside, location unknown, circa 1950. Crazy Shape Swimming Pools: Stomach Shaped Swimming Pool made by a wealthy Italian Gastroenterologist, Amalfi Coast in Italy. Crazy Shape Swimming Pools: Phallic shaped swimming pool created by artist Salvador Dalí at his beachfront house in Portlligat Spain, it is now the Casa-Museu Salvador Dalí. Crazy Shape Swimming Pools: Creating the Illusion of a Real Swimming Pool. 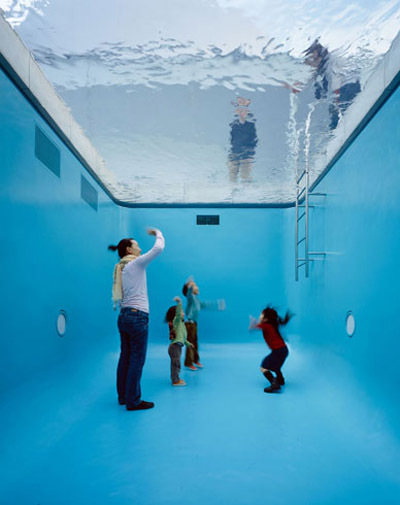 This amazing work by Argentinian artist Leandro Erlich called The Swimming Pool, for The 21st Century Museum of Contemporary Art in Kanazawa, Japan. A 10cm layer of water over a piece of glass separates above from below, 1998.